Rules-Lawyers are an unexpectedly hardy breed of disgusting humanoid (at least in physique) creature. To all outward appearances they are a normal human being, like you or me, and it is only by their strange behaviour and very close (often post-mosern) physical examination that they are revealed to be anything other than Homo Sapiens. Scholars are in agreement that Rules-Lawyers have been around at least as long as games of any kind have existed. * Role-Playing with Rules Lawyers: It can happen to the best of us. 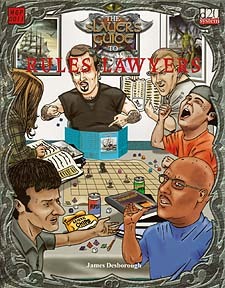 A Rules Lawyer makes his way into the gaming group and refuses to leave. Here we have a look at how to co-exist with this feckless creature. And introducing the Rules Lawyer character class, together with unique spells and feats!